Valero wants to import 100 train cars a day of crude oil into Benicia. Valero is BIG, and the oil industry worldwide is BIGGER! The only way we can stop Crude By Rail is if we all work together. Over 1500 have already signed the Safe Benicia petition. 1. Add your name to the SafeBenicia.org petition (click at left). 2. Study up – It is vital that everyday citizens of Benicia learn about this project. Read the About pages, including the Resources page, study the Documents and Reviews pages, and take note of Recent Posts here on Benicia Independent (listed at left). A great resource for letter-writing, etc. – Benicia Organizing Toolkit, by ForestEthics. Amy Million, Principal Planner, Benicia Community Development Department, by email: amillion@ci.benicia.ca.us. You may also send your letter Amy Million by mail to 250 East L Street, Benicia, CA 94510, or by Fax: (707) 747-1637. 6. Click here to check out our EVENTS page. Help promote events by sharing with friends and email contacts. Attend, learn, and voice your questions and concerns. You will receive a weekly email update with local news about Valero’s Crude By Rail proposal as well as national and international news on crude by rail. Together, we will show the strength in numbers of those who oppose the shipment of potentially explosive Bakken crude oil and dirty tar-sands “dilbit” in unsafe tank cars. 8. Check in with Benicians For a Safe and Healthy Community, at SafeBenicia.org. 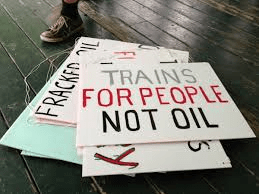 Volunteer or order a StopCrude yard sign here. “Like” the Stop Crude By Rail facebook page, and share with your facebook friends. Help raise funds for the organizing effort – click on GoFundMe above right.